The Johnstown Tomahawks have six NAHL regular season games in the books, and the team has an impressive 5-1 record. In case you were wondering, yes, this is the best start the team has ever had. The team just finished the 2016 NAHL Showcase with a record of 3-1. The only loss came in the third game of the showcase, vs the Austin Bruins. Austin is a team Johnstown has only played two other times prior, both at the showcase, and both were losses. Each Tomahawks' goalie picked up a win with League defeating former North Division team, the Springfield Jr. Blues, 6-3. Left-handed, Vinnie Purpura blanking the Wilderness 3-0, and registering the team's first shutout of the year. And just arriving, Drew Hotte, played stellar turning away 34 shots in the team's 2-1 win over the Shreveport Mudbugs. Johnstown has seen some roster movement, as to be expected at this early stage of the season. A few players are no longer listed on the team's roster, via NAHL.com. Goalie, Ryan Glander. Forward Patrick O'Neal. Defensmen Nick Criminisi, and Bray Crowder. Those subtractions were to make room for the following additions to the roster. Forwards Samuel Solensky, Mitchelle Hale, and defensman, Danil Bokun. All three were sent to Johnstown from Youngstown of the USHL. Drew Hotte, who the Tomahawks drafted number one overall in this past season's draft, was another player set down from the USHL, but not from Youngstown. Solensky and Bokun are both foreign players. 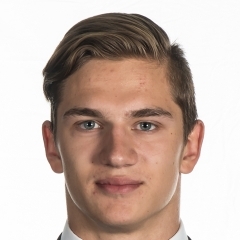 Since being added to Johnstown's roster, Solensky has four points in four games. The Tomahawks have their first major test this upcoming weekend as they will play two games in Fairbanks Alaska, vs the team that won the NAHL Championship last year. But before we take a look at that, let's give some attention to some of the Tomahawks' who've really been impressive thus far. To be fair, we could list everyone on the team. Being 5-1, means everyone is doing their jobs and doing them well. I'll just highlight some things you should know. We're only three weeks into the season and Dalton Hunter has already been East player of the week twice. The only week he wasn't named to be the best player in the East Division was when the Tomahawks didn't play. Hunter has played the last two season for the Tomahawks and in that time he's been more of a grinding, 3rd and 4th line player. With so many vets moving on from last year's team, which included a ton of skill, Hunter has stepped up into a top spot on this team. In only six games, he has nine points. Six of those points have been goals, which ties his total from last season. Very impressive. In 2014-2015 Hunter registered 10 points. Last year, 16 points. Ott has spent the last few season playing on the west coast. During the off-season he was looking to come back as close to home as he could. He's from the Philadelphia area. He found a home with the Tomahawks after the team selected him in the NAHL draft. Well, that home cooking is doing wonders, as Ott is tied with Hunter in team-leading points, with nine. He, with Hunter, is tied third in the league in scoring. I was going to list all three goalies as they've all been impressive so far this season. 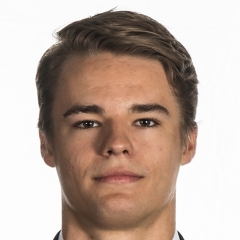 Once again, the Tomahawks came into the season with goaltending being a question as Andrew Lindgren advanced to college, and Glander, as stated above, is no longer on the roster. Vinnie Purpura get's singled out here for posting a shutout in only his second game of the season and second game of his junior hockey career. Buncis has been playing very well with six points in six games. He also was named 2016-2017 Johnstown Tomahawks' team captain. Buncis is one of the most hard working players on the Tomahawks' roster. This is his 3rd season with the club. Buncis will be leaving the team for two weeks later in the season, as he did last year, to compete in the Hockey World Juniors for Team Latvia. Last year, Team Latvia won it all, so this year they've moved up in into the A bracket. The A bracket has teams like Canada and team USA. Great play and honors all around for Buncis. As I stated earlier, Johnstown will play this weekend in Fairbanks. Fairbanks is always a tough team to play and take two points from. Johnstown has had some success vs Fairbanks, but not last season. Last year they dropped both games vs the Ice Dogs in Fairbanks. If Johnstown can at least split I think they'll be very happy with that. That being said, taking both games would really show that this team should be a force to be reckoned with all season long. Currently, Johnstown is tied for first place in the East. 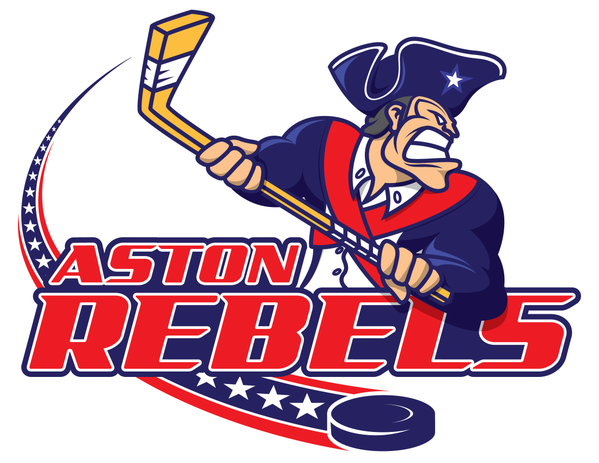 They're tied with their cross state rivals, the Aston Rebels. Both teams have 10 points. The following weekend Johnstown will play three games vs Kenai River Brown Bears. The Brown Bears had a horrible season last year with a league worst 4-51-5 record. They appear to have not gotten any better this year. So far they have a record of 0-3-1 and have allowed 15 goals, while only scoring 6. 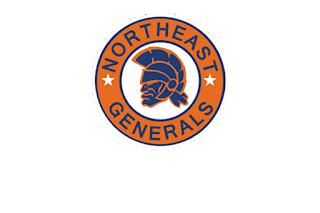 After playing the Brown Bears, the team will come back East and play the newest team in the division the Northest Generals. This will also be a three game set. The Generals still don't have a win on the season, as they are 0-5. The Johnstown Tomahawks could find themselves with a really impressive record going in to play the Aston Rebels in Aston, on October 28th and 29th. You never want to get to cocky, cause that's when you always get knocked down a few pegs, but Johnstown could very well have a record of 12-2-0 after these next three weeks. With the way the team is playing, it has everyone in Johnstown asking the question, "Is it November yet?". The home opener can't get here soon enough. 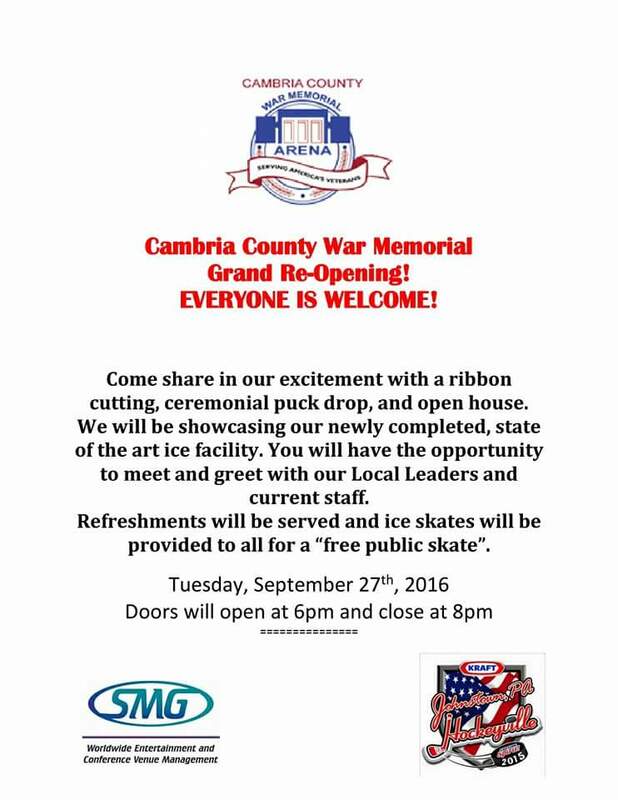 Today the War Memorial is having a free public skate to checkout the new renovations that have taken place this past off-season. The event is from 6pm to 8pm. Tonight the Johnstown Tomahawks take the ice in the first regular season game of the 2016-2017 NAHL campaign. The team will go into their first weekend of action with a roster of 29 players. Every player that participated in last weekend's preseason games are still on the roster, but the team also added two more players to that list. Both of these players were trying out for the Youngstown Phantoms of the USHL, but did not make their roster. Quetell was Johnstown's second tendered signing during last year's season. He spent all of last year playing in the USPHL U18 league for the Selects Hockey Academy U18 club. In 26 games he had 15 points. Quetell stands at 6'0 and weights 180. He is also a left shot. When he was tendered by the Tomahawks, head coach Mike Letizia had this to say. "We are very excited to sign Andrew for next season. He is a solid two-way defenseman with a very good sense for the game. He is an elite skater that will translate to our level." Hale is a 6'1, 180 pound forward who spent last year playing for the Buffalo Jr. Sabres U18 team. In 32 games he registered 13 points. Like Quetell, Hale was also a Johnstown Tomahawks' tender coming into this season. Mike Letizia had this to say to when the team made the announcement of tendering Hale. "Hale is a forward who skates well and is very effective on the forecheck by getting to pucks first and making contact. He is very physical, uses his size well, and protects the puck well in the offensive zone." Adding, "His offensive ability is very good." The Tomahawks will most likely keep the large sized roster until the NAHL showcase is over. As in years past, once the showcase takes place the team usually makes a handful of cuts. This year looks like no exception. Of the 29 players on the roster there is one man currently dealing with an injury. Defenseman Chris Trouba. Check out the roster yourself and see what numbers the players are wearing this year. Look at that d-core. Nobody under six feet tall. They will be hard to play against this season. Below is the Tomahawks official press release on the opening night roster. Note: Team captains have not been announced yet. Once we find out that information we will pass it along on our Twitter and Facebook pages. The Johnstown Tomahawks have released the team roster for the 2016-17 North American Hockey League regular season. 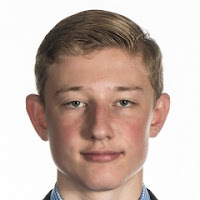 The list of forwards include Josh Biasillo, Nick Bruce, Filips Buncis, Riley Doyon, Mitchell Hale, Tommy Horn, Dalton Hunter, Joe Kile, Sammy Nardicchio, Josh Norman, Patrick O’Neal, Donovan Ott, Hayden Rowan, Chris Rupp, Tiernan Seningen, Alex Singley and Cameron Smith. The defensive unit is comprised of Nick Criminisi, Bray Crowder, Zak Galambos, Edward Hirka, Andy Iehle, Ian Kwant, Andrew Quetell, Adam Pilewicz and Christopher Trouba. The players at the goaltending positions are Ryan Glander, Britt League and Vinnie Purpura. Season ticket packages are available for as low as $99. For more information, contacct the Tomahawks office at 814-536-GOAL or visit JohnstownTomahawks.com. Labels: 2016-2017, Andrew Quetell, Johntown Tomahawks, Mitch Hale, NAHL. 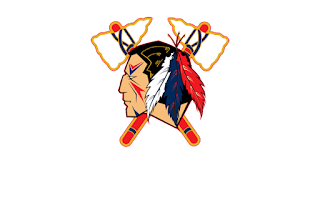 Since the Johnstown Tomahawks joined the NAHL for the 2012-2013 season they've seen many changes to the league when it comes to the teams that have participated. In Johnstown's short five year span, they've been part of two totally different divisions. When they first entered the league, Johnstown was part of the North Division. That division no long exists. Springfield and Janesville both are currently members of the NAHL but are now part of the Midwest Division. Port Huron moved to Johnstown's backyard and became the Keystone Ice Miners for one season. The Soo Eagles relocated last season and became the New Jersey Jr. Titans. Kalamazoo Jr. K-Wings folded and have not played since 2012-2013. There are multiple reasons why junior hockey sees so many teams fold, change cities, or change leagues. We won't get into those reasons today. But just for some perspective, in Johnstown's four season (this will be the fifth) the league has had eleven teams, either fold or relocate. So, it's nice when the league doesn't lose any teams during the offseason, but instead adds teams. During this past offseason, that's exactly what has happened. One of those teams joining the league will play in the East Division. There's rumors that the 2017-2018 might see a few teams leave the NAHL, and sadly one or two of those teams may very well come from the East Division. Last year with only a four team East division there wasn't much variety when it came to who the Tomahawks played. With the addition of a new team in the east, it will give Johnstown more teams to play against like they did when they were part of the North Division. The league was trying to add a sixth team to the East, but just like last offseason, those plans didn't pan out. So who are the two new teams? Let's start with the one in our own division. The Generals are a brand new franchise, as they did not relocated from any previous NAHL market. 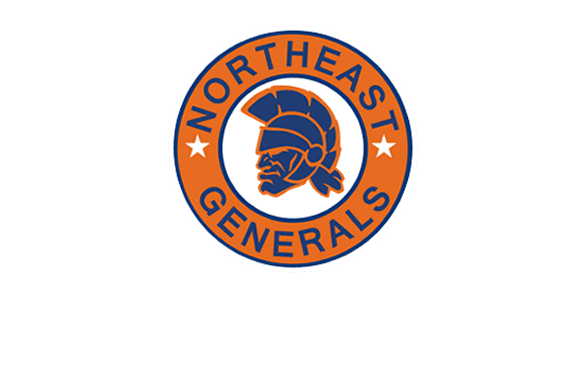 They will be the furthest team in the division that Johnstown will visit season as the Generals will play in Attleboro, Massachusetts. Attleboro is a suburb of Boston. Attleboro is about a 12-hour long bus trip. Just as long as it would take to travel to play the Soo Eagles a few years ago. Johnstown will remain the only team in the division to play in a "real" hockey arena. Though, the Generals' ice rink is brand new, it is yet again another recreational type of arena. Most team's arenas are just like this at the NAHL level, though the South Division teams are not. More on that in a few moments. The Generals will play at New England Sports Village. Here is a little video of the area that is featured on their website. At least they're like the New Jersey Jr. Titans and have seats, instead of bleachers. This is the second new team in the league and they will be part of the South division. 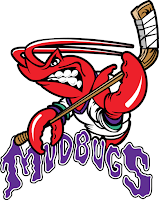 Johnstown will play the Mudbugs once this season. That game will take place during the NAHL Showcase. If you follow minor league hockey, you might be saying "Shreveport Mudbugs sounds familiar". You'd be right. They used to play in the CHL (Central Hockey League) from 2001-2011. In fact most of the NAHL south division used to have teams that played in the CHL. Because of this, they all play in "real" hockey areas and not areas that are in the style of a Planet Ice, aka rec rink. 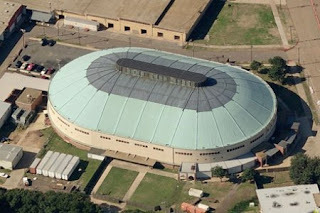 Shreveport will call the Hirsch Memorial Coliseum home, which holds a capacity of 10,300. Last season, the South division had some of the best attendance numbers in the league, other than Johnstown, who finished second with 2,294 average fans a game. Corpus Christi lead the league with 3,031 fans a game. Amarillo was fourth with 2,188. Odessa was fifth with 2,083. Lone Star sixth with 1,981. Whichita Falls was seventh with 1,659. Topeka was thirteenth with 1,004. To compare with the East division, who, other than Johnstown, finished in the bottom three of the league. New Jersey - 421 fans a game. WB-Scranton - 365 fans a game. Aston - 344 fans a game. In case you were wondering, the Keystone Ice Miners, in their only season in the NAHL had an average of 525 fans a game. Well, just like that the preseason is over. But no need for tears. With the tune up games out of the way that can only mean one thing. Regular season hockey. The Johnstown Tomahawks help the NAHL kickoff the 2016-2017 regular season with their first game this Friday (September 9th) in WB-Scranton. To keep yourself occupied before that game, and until we write a new post, enjoy these articles from over the weekend (if you haven't checked them out yet) and social media links. In Gary Betman's (NHL commissioner) opinion, this is what scores in hockey should be all the time. For a game that featured sixteen goals in three periods, it was the least entertaining game of the weekend. 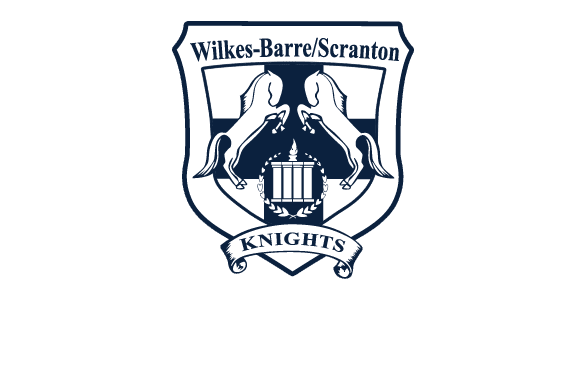 After a close battle with Wilkes-Barre/Scranton on Friday night and a hard hitting game vs the Apple core on Saturday, Sunday's game was mostly blah. Sure, the Tomahawks scored quiet often, in fact six goals in the first period, but as far as competitiveness, there really wasn't much in this game. I'm not speaking of Johnstown's effort, as they controlled the whole game. There wasn't a shots-on-goal clock for this game, but I think it would be safe to assume that Johnstown had well over forty shorts. New York, maybe half of that (if I'm being generous). New York's team was already down a few players after Saturday night's game, due to injuries. When the Apple Core took the ice on Sunday, they only had sixteen players dressed, three of which were goalies. In the first period, Johnstown's Josh Norman laid out a devastating hit at center ice which sent a New York player down to the ice. He remained there for several minutes, before being helped off the ice. I don't think New York would have given Johnstown a better game on Sunday if they had all of their players, but the fact that when they'd make a line change in-between whistles they only had two guys left on the bench, didn't help their cause. Johnstown, from the start, was able to ware down the team from New York and it showed on the scoreboard. With such a lopsided game, it's hard to say how Tomahawks' goalie Vinnie Purpura looked. Yes, he allowed five goals. Yes, he didn't see many shots. That's just the problem. Purpura didn't see action for long segments at a time. It's hard to keep yourself in the game when you're a spectator for most of it. Players for the Tomahawks that had shinned in the first two games of the weekend, continued that trend on Sunday. Three of the biggest standouts from the weekend were Nice Bruce, Riley Doyon, and Joey Kile. All three played great and were offensive threats every game. After a shaky start in Friday's game, the D-men wearing the team's third jersey, really locked things down. All the guys on the blueline, skate very well, and have good size. If you make your season prediction on how the Tomahawks will do this season, you've got to think based on these three games that they'll fair very well. Then again, it's hard to make an exact prediction as two of the three games where verse the Apple Core who play in a lower league, didn't have a full bench, and have a terrible team name. We won't have to wait long now to see just how well Johnstown does this season as the first regular season game is this Friday vs the Wilkes-Barre/Scranton Knights. Of course, this will be the start of a sixteen game road trip the Tomahawks will find themselves on to start the season. Make sure you follow us on Facebook and Twitter for updates and to chat with us and fellow Tomahawks' fans. The second night of pre-season NAHL hockey action saw the Tomahawks beat the New York Apple Core, 5-2. For the second straight night Johnstown fans packed the stands to catch some September hockey. Speaking of fans packing the house tonight, I think we can all agree this was the biggest fan sitting in the bleachers. Kinda weird to have a huge industrial fan just sitting on the bleachers, but whatever. Tomorrow afternoon the Tomahawks will play their last pre-season game, once again vs the Apple Core. 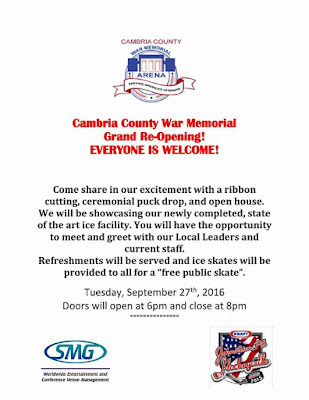 This time they'll take their community hockey tour to the arena in Ebensburg, Pa a sister ice surface of the Cambria County War Memorial Arena. 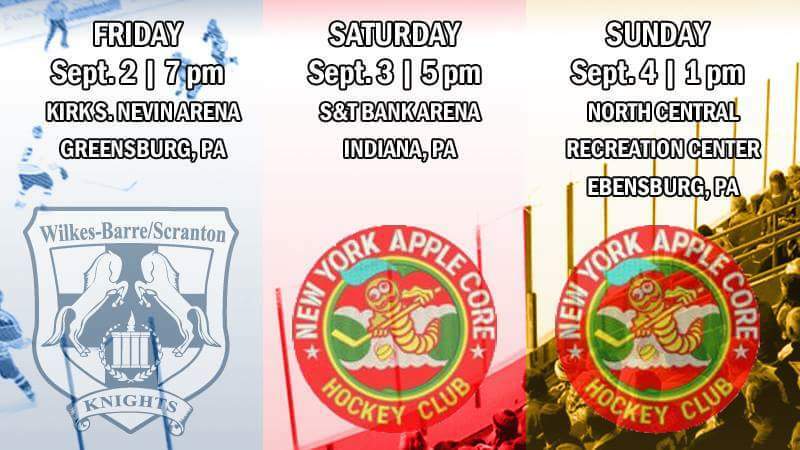 The Apple Core play at a Tier 3 level, while the Tomahawks play in the only Tier 2 league in the United states. Given this fact, and that the Apple Core had a record last season of 6-31, Johnstown's chances of winning this game looked to be in their favor. Johnstown had a two goal lead for most of the game, until New York tied it in the third period. Once again, for the second straight night, Johnstown blew its two goal lead. Luckily, the team didn't get down on themselves and quickly regained the lead and then pulled away with the win. For tonight's game there were two negatives. The first, I already touched upon. Blowing another two goal lead. The second was the penalty minutes. At one point in the game, Johnstown had to kill a 5 on 3 for over three minutes. This lead to New York scoring their first goal of the game. In total, Johnstown racked up 54 penalty minutes (compared to New York's 19). To be fair though, 40 of those minutes went to Tommy Horn in one play. For those not in attendance, Horn laid a huge hit by the penalty box, sending the Apple Core player falling awkwardly into the boards. Without hesitation, a New York player challenged Horn to a fight, which Horn accepted. The fight was pretty one-sided with Horn getting the win. While trying to kill off Horn's boarding major, Tomahawks d-man Andy Iehle received a five minute major penalty for a hit along the far side boards. If you want, as most fans in the crowd did, you can blame the ref for the high penalty total. The Horn hitting from behind call was questionable. Iehle's wasn't, at least from our angle. - Chris Rupp, who played in his first game of the weekend, netted two goals for the Hawks. - Reily Doyon scored another goal. That gives him five points in two games. Going to be fun watching him play this season. - Joey Kile and Patrick O'Neal also scored goals for the Tomahawks. - In goal was newcomer Britt League (pretty awesome name if you ask me) who turned away 18 of 20 shots. - Vs the Knights in Greensburg, the Tomahawks' d-men made some very bad plays with the puck. Tonight, that wasn't the cause and Ian Kwant made some really nice plays stripping men from the puck in the third period. - Sammy Nardicchio sat in the penalty box a few times for the Tomahawks. In the third period he had to go to the sin bin after throwing an Apple Core player into the Tomahawks' bench. Nardicchio, who looked like he was playing with some grit out there, racked up 126 penalty minutes last season when he played for the Islanders Hockey Club of the USPHL Premier league. Note: Tomahawks currently have three goalies on their roster. Glander (played Friday), League (played tonight) and Vinnie Purpura will play tomorrow afternoon. Tonight in front of a packed house in Greensburg, Pa the Johnstown Tomahawks beat the Wilkes-Barre/Scranton Knights, 4-3. This was the first pre-season game of the weekend. 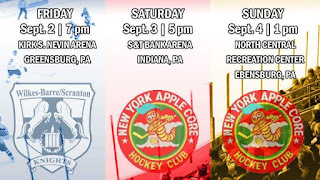 Johnstown will play two more (Saturday and Sunday) vs the New York Apple Core. Below are just some quick thoughts from tonight's game. Remember, this is just one man's opinion. Leave a comment below or talk to us on Facebook if you agree with what's written below, or if you saw something not mentioned here. - It was great to see Cameron Smith back on the ice. The Tomahawks forward had his season cut short due to an injury last year. Smith, was flying up and down the ice and generated a ton of scoring chances for the team, especially in the first period. If Smith can stay healthy, he'll be a great asset to the team in 2016-2017. - Returning player, Tommy Horn had a very good game, scoring a goal. He also had a nice hit in the corner. He seemed a little more "mean" out there tonight then I remember him being at any point last year. This isn't a bad thing. It help get the W.
- Ryan Glander didn't make any huge saves but he did make a couple timely ones. He plays a very calm style in net, much like Ryan Bednard when he was in goal for Johnstown. - Bray Crowder is a towering player out on the ice, standing at 6'6. For such a tall kid, he skated very well. - The team played really well around the goal crease in the offensive zone. Several of the goals were scored from soft hands, and great composure up close on the goalie. - Riley Doyon wore number 44, the same number his brother wore last year. He registered three assists in the game and has pretty good size. Seems to be the more offensive talented one of the family. Does he have the same temper as his brother? Only time will tell. - Nick Bruce had a very strong and impressive game tonight. The Canadian scored two goals for the Tomahawks. With Johnstown loosing Lynch, Romano, and Linkenheld, Bruce might be a guy, along with Norman, that can help restore the firepower the team lost in the off season. 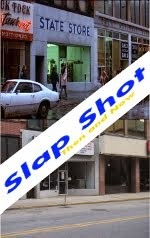 - The small building was filled with fans. Sad to think that there was more people at this game then what the Knights usually play in front of during a regular season game at their own barn. - While you can be happy about the win and be excited about some of the potential you saw in the new players, it was still just a pre-season game. You don't want to get to high but you also don't want to get too low. There were a few bad things that happened in the game tonight and I'll cover those as well. - Defensive turn overs. A lot of great scoring chances came from the Tomahawks D-men giving the puck away right in the slot. Most of these terrible giveaways happened in the first period. - Johnstown was up 3-1 at one point before blowing the two goal lead. Again, it's only pre-season but giving up a lead was something the team did do often last season. It's a wonderful feeling knowing that hockey season is here again. After getting back into things tonight, and with two more games this weekend, it's going to be tough to have to wait till November to see the Hawks back on home ice. A road trip might be in order. Labels: 2016-2017, Johnstown Tomahawks, NAHL. Today is September 1st. This is when people can become depressed. For kids, school has started back up. For people who love nice weather, this is where you start to realize summer is over. Fans of the Minnesota Twins, maybe you’ll do better next year. The list could go on and on. There is one thing that can give you a boost your spirits, especially the people in this area. Hockey season is here. The NAHL that is. The offseason, which this year, seemed shorter than the rest, is finally over. The Tomahawks have been back in town for at least a week now, preparing for the season to start. This weekend the team will take the ice for three pre-season games. This will be their only tune up before the season starts the following week, in Wilke-Barre/Scranton. If you live in the area, make sure you come out to the games this weekend, because you won’t get another chance to see the team play a “home” game until mid November. Why? The Tomahawks have a front loaded away schedule this year due to ice renovations at the War Memorial. Sure, it’s going to be hard to have to wait until November to see the Tomahawks battle inside the War Memorial Area, but there is an upside to playing 19 straight games on the road. Lots, and lots of home games the second half of the season. From December to March, Johnstown will play all but two weekends at home. The Tomahawks finished last season with the second best attendance numbers in the NAHL, averaging 2,294 fans a game. It’s no secret that the Tomahawks don’t draw as well in the first half of the season compared to the second half, due to high school football and other fall activities. Having the majority of home games happen in the second half of the season can only mean good things for the Tomahawks. The Tomahawks ended last season with a home record of 16-12-2 in the regular season. While in past seasons we’ve compaired the previous season’s team to the new one, we can’t really do that this season. Other than a few returing players, this 2016-2017 Johnstown Tomahawks team is basicly brand new. Not just on the ice but also off. Rick Boyd who’s been with the team since their first season, is no longer with the club. This is the first time that the coaching staff, along with help from team president, Rick Bouchard have put together this year's roster. Did they do a better job then Boyd or worse? Only time will tell. The front office also saw a few changes. Katie Saylor, who was an intern for the Tomahawks and then was hired to a full time position has left the team. During the offseason she married former Johnstown Tomahawks’ forward Zach Wallace. In her place and becoming the new Jill-of-all-trades, is Autumn Rogers. The Tomahawks also added Derek Partsch who will take on the role of manager, sponsorships and group ticket accounts. On the ice, the Tomahawks have only eight returning players from last year’s roster. It could have been ten but during the offseason the team let go of two players. Adam Ostrowski this season will be playing for the Coulee Region Chill of the NAHL. 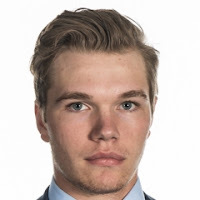 Forward Luke Picek will be playing for the Springfield Jr. Blues also of the NAHL. The players that are returning (at the time of this article) are Adam Pilewicz, Zac Galambos, Dalton Hunter, Filips Buncis, Tommy Horn, Tiernan Seningen, Ryan Glander, and Cameron Smith. The East Division will bring back the same teams from last year, and one more. 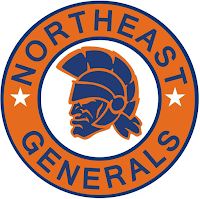 The Northeast Generals will join the east this season and be the fifth team in the division. Most likely, though not announced yet, the top four teams in the division will make the playoffs. This means, unlike last season when everyone in the division made the playoffs, all but one team will make the playoffs this season. The Generals will have a somewhat familiar face playing for them. Former Johnstown Tomahawks’ d-man Aaron Murray is currently on the Generals’ roster. Murray played in two games for the Tomahawks two seasons ago. The New Jersey Jr. Titans lost both their head coach and assistant coach this past offseason. With a new man behind the bench the Titans are only returning a total of two players. So, much like Johnstown, it’s hard to predict how good, or how bad, New Jersey will be this season. As for the three games this weekend, that information can be found in the picture below, which is from the Johnstown Tomahawks Facebook Page. We will know who wins the US election before we get to see the Tomahawks on home ice in the regular season. So if you can, make it out to at least one game this weekend, or you’re just going to have to hit the road with the team for the first two months of the season. Note: The first roster deadline is today. The NAHL hasn’t posted any rosters on their website yet. The Tomahawks haven’t officially release their roster yet. When they do, we will post the links on our Facebook and Twitter pages. The team does have a roster of their protected players which they've updated today, and we have, but we won’t release any of that information until the team or the NAHL does. Before I wrap things up I'd like to take a moment of your time and talk about a film project I'm currently working on. 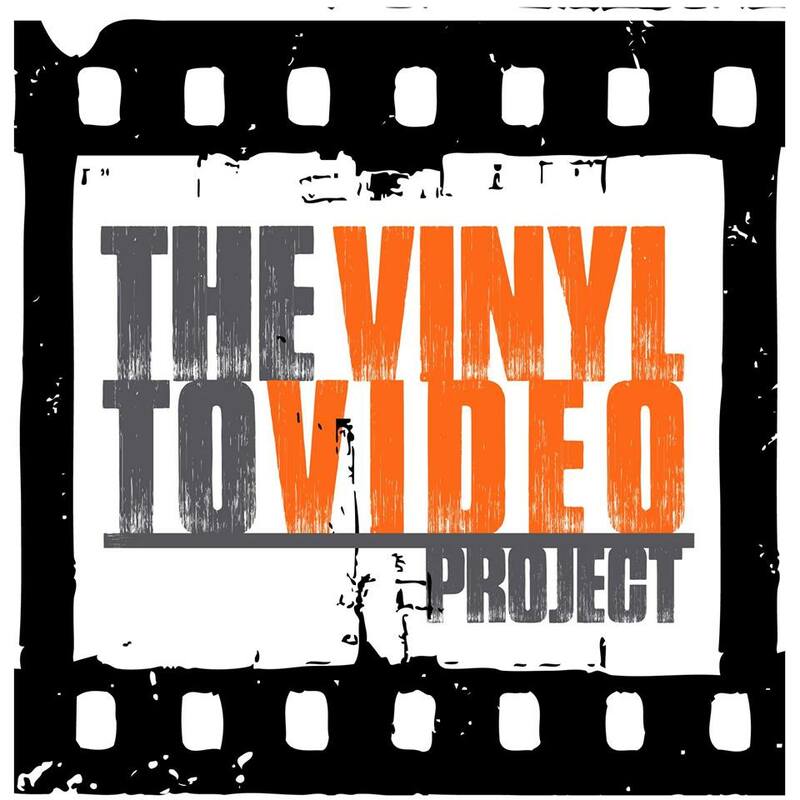 It's called Vinyl to Video and will be four short films that are inspired by popular songs. We have a Facebook page you can check out and it would mean SO much if you could give the page a like. We'll be making some major announces about the project soon and have information about how you can be a part of the films. Please share the page with your friends and family. We're trying to get 500 likes before the end of September. I was a writer for one of the films and I'm also doing some behind the scenes production work. You're all awesome and I can't thank you enough. This project, on top of several others (which I hope I can talk about soon) are the reason why this page hasn't been updated often. Though I'm business chasing my film/tv dreams, I do keep the Facebook page up to date, so if you're looking for the latest news on the Tomahawks make sure to check us out there. The Johnstown Tomahawks are getting close to the finish line, aka, the end of the NAHL regular season. There’s eight remaining games on the schedule with six of them coming at the Cambria County War Memorial Arena. This is the team’s fourth year in the NAHL and they have the chance to set a new franchise record before the season ends. That record? Most wins in a single season. The current record stands at 28 wins. This was set in the team’s second season back in 2013-2014, under former head coach, Jason Spence. Though that season had the Tomahawks winning the most games, they finished with 61 points, which was behind the season before. The Tomahawks set that record in their first year in the league, with 66 points. Currently, the Tomahawks sit at 26 wins and 57 points, one point behind last year’s total. With eight games remaining, four vs Aston and four vs Wilkes-Barre, the team could get a max of 34 wins. Will that happen? Probably not. It would be the team’s longest winning streak of the season. With that said, it is quite doable for the team to at least finish the year 4-4. If this would become the case the team would end the season with a nice 30 win season. The most points the team could add to their standings would be 16, if they swept the remaining games. If they go 4-4, with all four losses coming in regulation their point total would be 65. This would be the second best finish in the team’s history. Now this .500 winning percentage for the rest of the year is being conservative. 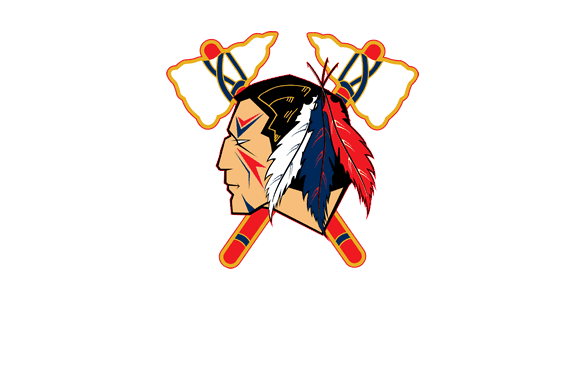 The Tomahawks have beat both Aston and Wilkes-Barre in the past, and if they play well, and stay disciplined, they could do better than a 4-4 record. Currently, the Tomahawks sit third in the East Division out of four teams. This year everyone in the division makes the playoffs, so unlike last season, Johnstown will participate in the Robertson Cup Playoffs. New Jersey sits atop the division with 66 points. Aston is in second place with 62. 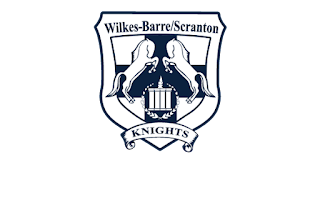 Wilkes-Barre is in fourth with 46. If the playoffs were to start today, New Jersey would host Wilkes-Barre and Aston would host Johnstown in a best-of-five match-up. With eight games left in the regular season, Johnstown could move up in the standings, getting home ice advantage and help set a new team record in regular season wins. Only time will tell, but we won’t have to wait too long. Johnstown, Pa - The Johnstown Tomahawks are in the last stretch of the 2015-2016 NAHL season. The team has eight games left on the regular season schedule, with six of them taking place at the historic Cambria County War Memorial Arena. The team is looking to break the regular season record for wins in a season (28) and can tie that record this weekend with two games against Wilkes-Barre/Scranton. 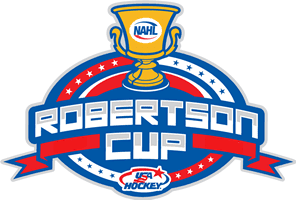 The Tomahawks are looking to move up in the East division standings to secure home ice advantage in the Robertson Cup Playoffs. For the next remaining home games the team will have exciting game promotions for the loyal Johnstown fans. One of those great promotions comes this weekend, Saturday (3/12/16) against the Knights. Local beloved celebrity, Jim Burton will be on hand for the ceremonial puck drop before the 7pm match-up. A staple of the Johnstown community and surrounding area, Mr. Burton will be on hand to drop the ceremonial first puck and mingle with fans while promoting a great non-profit organization Beginnings Inc., who work to enable children to reach their full potential developmentally and help families grow strong through early intervention and educational opportunities. He’s also been a proud support of the Johnstown Tomahawks. Fans are encouraged to stop by the merchandise stand area behind section 21 to meet Mr Burton, win prizes and donate to Beginnings Inc.
To purchase tickets for both games, call Ticketmaster at 1-800-745-3000, by logging onto JohnstownTomahawks.com or by visiting the War Memorial Arena Box Office Monday through Friday, 10 a.m. – 6 p.m. For more information, fans can call the Tomahawks office at 814-536-GOAL (4625). There’s nothing quite like a hockey rivalry. The excitement, the energy, the hate, that goes into it is not only something special for the teams involved but the fans of both sides as well. Sometimes a rivalry is made based on the games the two teams play against each other. Other times, different factors come into the equation that morphs two teams into bitter enemies. Distance between the two teams, schedule, and refereeing are just a few things that can take things to the next level. For Aston and Johnstown, everything has factored into these two teams building a healthy hatred for each other. With about one month to go in the NAHL season things are only going to get more heated between these two teams. Why that is, and what needs to be done to make sure things don’t get completely out of hand, I’ll break down later in this article. First, let’s take a look back to this past weekend and the “press release” that Aston posted on their official team page about Saturday night’s game. This game recap from Aston we shared on our Facebook page and everyone in Johnstown had a field day with it. It’s filled with inaccuracies and a ton of whining, something you’d expect to see from a blog (not this one, we’re very classy) not from an official organization. Funny enough, when I started writing this article I headed over to Aston’s website to have the press release in front of me when I quoted it. To my surprise the game recap has been edited. Gone is the statement at the beginning where the recap tried to blame the Johnstown fan’s of causing Austin Swingle injury. Gone is the line saying Hudson was thrown out of the game in the first period only to return in the third to get into another fight. Gone is the wording that Johnstown basically went into the game looking to goon it up. After everyone calmed down from the crazy weekend, did cooler (and smarter) minds go back and edit the story and take the raw emotion out of the recap? Did the NAHL step in and tell the team it’s a poor reflection on the league to have something like that on one of their team’s websites? Does it really matter? Not really. To be honest the only thing that really matters is the game itself. Aston came into Johnstown and took three out of four points on the weekend. Does a battle of words make things more fun and build the rivalry. Yes! And as a fan, that made it exciting. Let’s take a deep breath and put this game recap to bed. It was written, edited, and now it’s over. But what lead to it being written? Obviously the the heated play on the ice and the injury to Aston forward, Austin Swingle. If you’re a Johnstown fan or an Aston fan we can all agree that we’re all happy to hear that Austin Swingle seems to be doing okay, all things considered. You never want to see a player of any age, for any team, be severely injured. Swingle has a concussion and a snore neck, but should return to the ice as some point. That’s great to hear. Now, this bitter rivalry didn’t start from the hit Alex Alger laid on Swingle in the second period. No, this has been building since the exhibition games this season. If you remember, the Tomahawks played two pre-season games vs Aston, and both of those were very physical and even included an old fashioned line brawl in the second game. For whatever reason, right from the start these two teams had a dislike for each other. One of those reasons could be the amount of games the two teams play against each other. With the way the NAHL works, other than the Showcase at the start of the year, and a trip to Alaska, the East Division only plays games among itself. When there’s only four team in the division, this means you’re playing the same three teams every weekend. That right there is reason enough to start building a rivalry with each other. Another factor is the way the East Division team’s are built. There are twenty-two teams in the NAHL. Out of those teams, there are six teams with over a thousand penalty minutes. Four of those teams play in the East Division. Not surprisingly, Johnstown leads the league with 1,294. The East is built tough. Things are only going to get more physical in the playoffs, which if you don’t already know, every team in the east automatically makes the playoffs this year. With all four teams making the playoffs even before the season started, this year has been all about battling for home ice advantage. The team that finishes first in the division will play the fourth seeded team. Two will host the third. If the standings would stay as is, New Jersey would host Wilkes-Barre/Scranton. Aston would host Johnstown. More on that later. These East teams aren’t afraid to drop the gloves, even if it comes with an automatic fifteen-minute penalty. The leading team fight leaders in the NAHL sit with nineteen. That’s a tie between Wilkes-Barre/Scranton and Johnstown. New Jersey has 14 for 4th in the league and Aston has 13 for 5th. You probably can guess which players lead the league in fighting majors. Logan Hudson sits at the top with seven. Doyan with five. Guess who’s tied with Doyan’s five. Yep, Aston’s forward, Swingle. Back in November, Swingle and Hudson dropped the gloves with each other at the War Memorial. If you remember, Hudson knocked out Swingle. In the original game recap for Saturday’s game, they made it sound like Swingle is a playmaking forward that never participates in the rough stuff. That just isn’t true. Now I’m not saying that as a way to make in injury this past weekend justifiable, but what I am saying, he is a tough customer and is use to the physical side of hockey. Swingle stands at 6’3, 230. He’s already got pro size at the junior level. He also has some skill to his game. In 44 games he has 14 points and leads his team in penalty minutes with 117. Swingle is a team guy, just like Hudson, hence why his whole team stayed on the ice until they knew he was going to be okay. He’s the type of guy you want on your team, because he battles and sticks up for the other guys wearing his jersey. That’s also the reason you have to believe that his teammates will be looking for some revenge next time they face the Tomahawks, which will only make things even more tense. The Tomahawks and Aston play four more games against each other this season. Those four games are all back to back. It’ll be like a mini playoff series right before the real playoffs. If these two teams, meet in the playoffs, they’ll play in a best of five series. So in the span of the next few weeks, two teams that don’t like each other, could possibly see each other nine more times. Grab your popcorn, this should be entertaining. You might have missed it on Friday night, but after the second period buzzer sounded, Aston’s head coach and Johnstown’s assistant coach shared not so friendly words with each other. After the game, they did it again with the ref having to come in between the two to make sure things didn’t get out of hand. A good rivalry doesn’t involve just the players, but the coaches as well. The exact seasoning why the coaches weren’t seeing things eye to eye isn’t a hundred percent but if you watch the game closely, as I try to do, you can get an idea of what it might have been about. On Saturday it was no doubt the hit that left Swingle being carried off on a medical stretcher. Reports from several sources say that the Aston coach found himself trying to get into the Tomahawks locker room twice, but being escorting away both times. I can’t say this did happen, but it sounds like something that might have taken place. As for Friday, what might have ticked Shackford off towards Aston’s head coach was the way his team was reacting after scoring their goals. In the second period Aston’s Cusin scored to put his team up 2-1. As he skated towards the glass to celebrate with his teammates he pulled a Max Talbot and tried to shush the crowd. Then when the Rebels scored yet again towards the end of the second period to go up 4-1, Yakovlev had some taunting words towards Zak Galambos. This resulted in the ref handing Yakovlev a ten-minute misconduct. The way Aston was “disrespecting” the Tomahawks in their own arena is probably why Shackford tried to take matters into his own hands. On Friday, the ref did a decent job keeping the game under control. That was not the case on Saturday. As the game went on you could tell that it was only a matter of time until someone got seriously injured. Sadly, the ref didn’t step in in time and that’s just what happened. In the first period, the ref did try and do his best to keep things from getting out of hand. Johnstown’s Picek was given two penalties. Both were the right call, though instead of calling tripping the first time, the more oppropreit call would have been charging. On Picek’s second penalty he once again charged from the blue line and ran an Aston player into the wall. This time, he has giving a hitting from behind penalty and a ten minute misconduct. Later in the period, Hudson and Yakovlev dropped the gloves after a battle in front of the net. Both guys were will participants, with Yakovlev connecting with most of the punches. When the linesmen stepped in to break up the fight, neither player stopped fighting. The ref, made the correct call and on top of the fighting majors gave each player an additional ten minute misconduct for continuing the altercation. This gave both players 25-minutes in penalty and they did not return until the third period. In the second period, it appeared that the Tomahawks had finally scored their first goal of the game. But the ref waved it off, citing goaltender interference. Even though, I’m a Johnstown fan, as soon as the puck went into the net I knew it was going to be waved offed. From my view it appears the ref got the call right. Well, the Tomahawks felt otherwise and had words with the ref and what they felt was a blown call. In the arguing Drew Doyan got too heated, as he’s done in the past, and got himself ejected. Again, this was the right call. You can only throw a fit for so long. This isn’t the first time Doyan got himself ejected for yelling at the ref. This is something he must find a way to control. He can’t help out his team sitting in the locker room. With the goal waved off, and penalties racking up against Johnstown, they started to play with some passion. As the game went on and on you could see something big was going to happen and all hell was going to break loose. The ref put away the whisler. With each non call the hits got bigger and bigger. Lynch tooks a stick up to the face, which was not called. Lynch is a great player and just as good of an agitator. You never know if he’s really hurt or just trying to get a call and under the other team’s skin. This time, though it did appear to be legitimate, but the ref didn’t call it. The hits kept coming and they were getting bigger and bigger. Alger had the puck by the boards and took a big hit from behind from Swingle. No call. Alger got back up and rejoined the play. He skated across the ice and hit Swingle by the penalty box. The two had a few words with each other as they skated into the Tomahawks zone. Swingle, went into the corner to play the puck, and that’s when Alger checked him. At first both teams stood around, some not seeing what had happened. Once they did, things started to get heated. We were on the verge of a line brawl. Luckily at this point, things quieted down. Alger was ejected and the Aston Rebels were given a five minute powerplay. The power play was interrupted when Lynch fell to the ice after taking a tomahawk chop to the head. The ref called it, making sure we didn’t have an all out donnybrook. Johnstown came out of the intermission and worked hard blocking shots, and found a way to kill off the rest of the major. They had the momentum. The game was now 2-1. Then during a line change several players started cross checking each other and a fight broke out. Hunter took on Bellant, the player who had chopped Lynch in the head. Away from the fight another one broke out between O’Brien and Underwood. This one supposedly started after Underwood, who wears a cag, spit on O’Brien. All players were ejected. The Tomahawks were battling together as a team and found a way to tie the game. In overtime Horn used his speed and put a nice shot against the goalie and got the game winner. The Tomahawks were beyond happen. Aston was anything but. The coaches, who usually shake hands after every game, did not. This game solidified the hate both teams have for each other. After the game was over I couldn’t help but think, “Thank god, Wood no longer plays for Aston”. If you remember Wood, was the short blond haired kid that agitated Johnstown so many times earlier in the season. After he speared a guy and got ejected (in a game not against Johnstown) he was dealt to Odessa. Could you imagine how out of hand that game could have gotten if he was still with the Rebels? As said before, these teams will play four games back to back in the middle of March. The only way those games don’t get out of hand is if the ref’s are on their game. I suspect everything will be called, whether it’s a penalty or not. If the ref doesn’t do this we could see few line brawls. With that said, there’s only so much a ref can do. Playoff positioning will be on the line. Aston will be looking for some redemption, and the teams will be looking to get an edge on one another if they so happen to meet in the first round of the playoffs. This rivially didn’t start on Saturday night, but it was taken to the next level. Can it get even worse from here?